The lightweight cold weather glove inserts are to be worn for added warmth with the intermediate cold/wet glove shells. 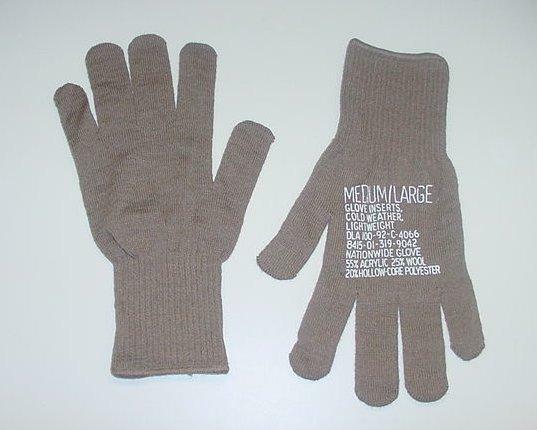 The glove inserts are of an ambidextrous design with knitted hands, fingers, and thumbs. All parts of the gloves except the cuffs are knit seamless with a plain (jersey) stitch. The cuffs are knit seamless with a mock rib with an elastic yarn laid in every other course and two elastic yarns inserted around the edge of the cuff. The yarn for knitting the gloves shall be a 55% acrylic, 25% wool, and 20% hollow-core polyester blend.